2018 was a difficult year for the Portland art scene (like the disappearance of Marylhurst University, talks of school mergers and the impending downgrade of the Hoffman Gallery), but it also saw the growth of some new venues and a lot of very strong exhibitions. Here is a look back at our most read posts and what follows here is just a bit of a summary. Yes the in depth "Portlandageddon" post is still coming in 2019 and will discuss where we are and what could or should happen. With that, enjoy the following summary of what PORT covered... sadly I think we all still miss Carol Yarrow, I still think of her every day. Hanakago at the Portland Japanese Garden showed just why they are consistently the highest caliber cultural cultural institution Portland has. 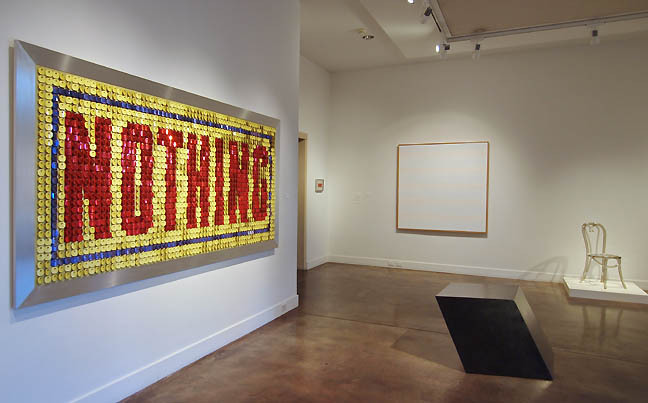 Here is Edward Winkleman on the history of art galleries on Artsy. The sense is the business is now driving galleries out of business. Art used to be the refuge of more marginal business mindings. 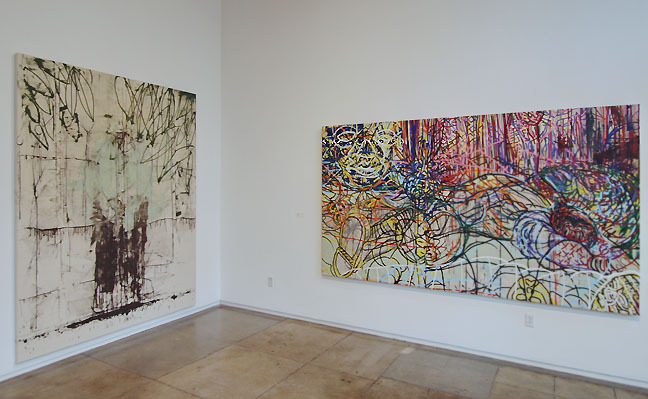 Here is a treat, Amy Sillman on Delacroix. This interview with David Lynch in Plazm isn't quite ruined by the annoying and cloying tone the interviewer takes. *Update: the Art Gym's records are headed to the Portland Art Museum. So a program becomes an archive... I must note that the PCVA's even more storied archive lives there as well. Overall, Im curious about what will happen to the Crumpacker Library archives after PAM's planned renovation/expansion? Hopefully this opportunity to make the library better known and accessed is seized upon. Also, the space vacated by the library will become a large contemporary gallery space. All that said, any move of the Art Gym away from its Marylhurst site changes things... one really can't turn back the clock. The thing is Portland should be creating more ideal organs of culture to serve its crucial art scene rather than just reshuffle the decks. PORT was just notified that the proposed merger between Oregon College of Art and Craft and Pacific Northwest College of Art is for now off after PNCA and OCAC board meetings. To us at PORT this merger never made sense other than for the fetish of this # of 1000 students but its clear that the much smaller OCAC needs a fairy godmother of sorts and the main problem is that higher education as a system seems to be collapsing under costs and student debt. OCAC has grown but I just cant see it having 1000+ students, ever. I suspect that would kill what is special about the college. Ultimately, PNCA and OCAC simply shared the same inherent needs/weaknesses and I likened the idea as trying to find a date for the holidays only to wonder about the long term feasibility? Instead, I think OCAC should think outside the box (how about OHSU, or a massive save craft campaign? Nick Offerman will be in the area in April folks, he's the face of craft... engage him). What's more PNCA should do what it has been doing by focusing on deepening their disciplines. The point is there are competitive advantages that need attention that a merger would be a distraction to. An art school that loses focus doesnt survive, it is just that simple and OCAC is special as a craft focused school. That said no one wants to see OCAC close like Marylhurst University recently did so OCAC needs a capital campaign and this is a major donation time. Ultimately OCAC is without an experienced president and therefore has a vision vacuum at the moment. (The whole merger was originally presented as a fait accompli, which seemed hasty). 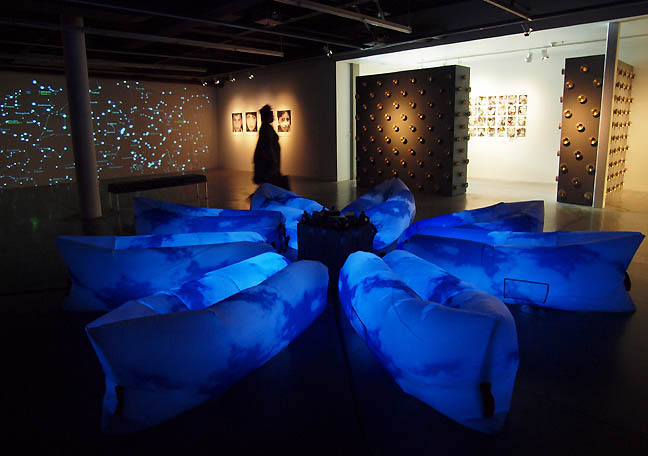 "Over the last three months, Pacific Northwest College of Art (PNCA) and Oregon College of Art and Craft (OCAC) have explored the potential of consolidating their two institutions. Today, PNCA's Board of Governors has made the determination that a merger at this time is not a feasible option and voted to decline the opportunity with OCAC. Both institutions entered these conversations with strong intention and dedicated rigor, engaging in an inclusive process that included faculty, staff and members of the board from both institutions. The PNCA community holds our colleagues at OCAC in high regard, recognizing their contribution to the American Crafts movement, art education and the rich legacy of the arts and creativity in the Pacific Northwest. OCAC has stated its intention to remain dedicated to providing the highest level of arts education in the City of Portland and throughout the Pacific Northwest. We wish them only success in moving forward." "During the last 3 months, OCAC and PNCA have completed a due diligence and negotiations process to understand the potential benefits and challenges of merging our two institutions. 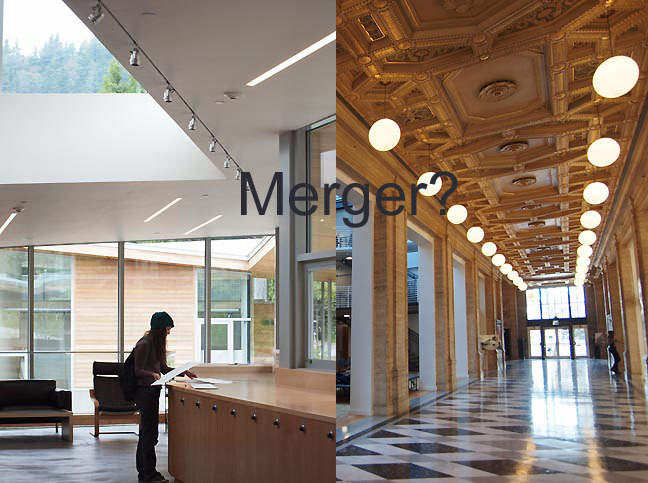 Today, both OCAC's Board of Trustees and PNCA's Board of Governors made the decision that a merger at this time is not a feasible option for our respective organizations. OCAC and PNCA remain dedicated to providing the highest level of arts education in the City of Portland and throughout the Pacific Northwest. The OCAC leadership is exploring other exciting opportunities to ensure the sustainability of our college and campus. We continue to be fully committed to finding the best possible pathway to a brighter future." Perhaps an innovative public private partnership? Perhaps a non art school? Either way nobody wants to lose OCAC and a committed campaign with vision needs to be mounted. Arguably one of the strongest and easily the most intensive two person exhibition ever to be mounted in in Portland, Loss of Material Evidence by Mark R. Smith and Maria T.D. 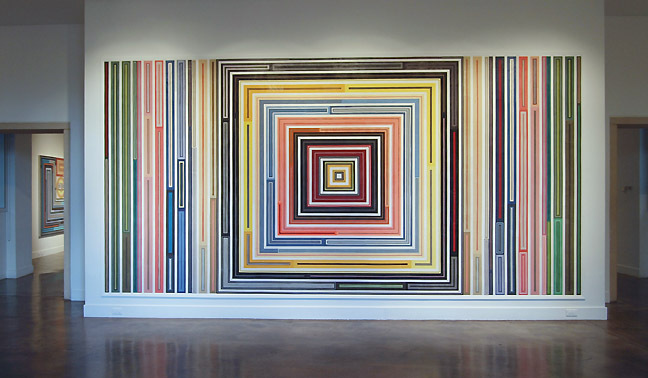 Inocencio at Lewis and Clark College's Hoffman Gallery, ends today. It also capstones its consummate curator's 20 year run in a blatant example of University administrative myopia and disregard for cultural offerings in higher education. First, let's concentrate on the exhibition as LoME is a tour de force in material as memory and pattern as personality translated via sustained activity/interaction with family members and other loved ones. This exhibition successfully goes into places where contemporary art often fails, specifically the persistence of personal familial affinity as a means of building meaning. It doesn't hurt that the two artists themselves constitute a family unit but I also appreciate how they both integrate and separate their individual voices. Perhaps, one can think of this as a memorable Thanksgiving dinner? For myself that what this constitutes, an extensive extended family feast... with all the simmering conflicts and savored time spent in reminiscence. All families, especially US families have to deal with the stuff the accumulate, but Mark and Maria made it into art and it cant help but be a gen X commentary. 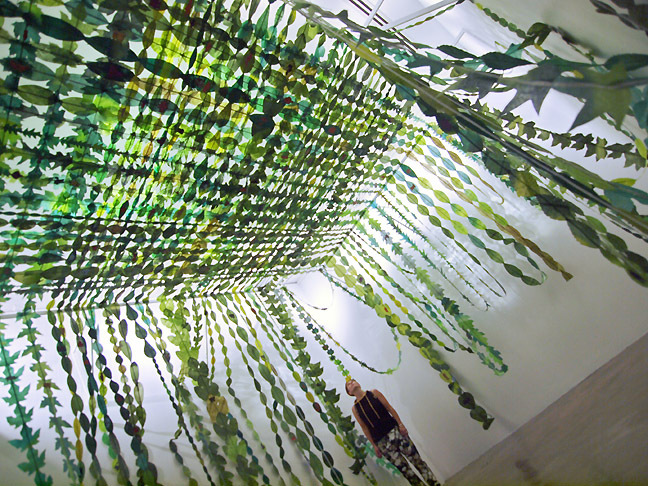 Visitors are greeted by Time Tunnel, a large collaborative labyrinth wall piece by the two artists. Marriage is in itself a kind of time tunnel and each contributed in distinct ways. Maria apparently contributed the intensive structure while Mark's impressive eye for color, texture and pattern make visually absorbing. As someone who pays close attention to couples in the arts (being in a one myself) I cannot stress how rare a successful and integrated collaboration like this is. Sure, it might resemble high modernism but what it really constitutes is nonverbal monolith of what a close knit team can do. Perhaps only in Portland is the subject domestic machinations fetished and put on display like this exhibition and it is a major element of what Portland's art scene does better than any other in the USA. What Time Tunnel does well is introduce the viewer to the mesmerizing effect of material as a kind of token evidence of a life lived. Being constructed of fabrics that had previous uses it presents an engaging and partial picture... presenting the scope of the subject matter. In particular, that of families that accumulate stuff, which is then dealt with as they age and eventually pass on. I am generation X and have personally had to deal with much of this already. Do L&C students realize how important a subject this is? Lewis and Clark College, known for being perhaps the most liberal of all of Portland's Liberal Arts Colleges has decided to "change....toward a more student-centered and student-responsive gallery experience at the end of this school year." That means their excellent curator Linda Tesner has been laid off and according to the school, "we plan to look for a faculty member to lead that process." The question remains is that a professional curator? Linda did shows of startling international caliber but also mounted excellent student and faulty shows that all benefited from a higher level of competence. Portland institutions are terrible at assessing caliber of cultural programs and it will be very difficult for this development to not become a downgrade. How does an institution that touts itself as, "A private college with a public conscience," defend an inward navel gazing + likely cost saving measure? How do the today's students feel now that they are being expected to program their own art experience when for 20 years previous students had a very interactive, socially conscious high caliber professional curator? At first I heard that the space was closing at the end of the school year, which seemed incredibly short sighted as this is one of the jewels in Portland's cultural scene and nothing could be more crucial to a Liberal Arts education than the actual "Arts." For years there has been bureaucratic pressure (like renting the gallery space etc.) but now the director+curator Linda Tesner has been laid off, despite having done an excellent job curating shows like: The world class: Open this End and this stunner and Alison Saar. Reading between the lines this move seems to devalue the curatorial expertise and contributions just like the the closure of the White Box did to their director. (Changing leadership when someone is doing a great job and is popular always looks odd to art critics). Then there was the way the Art Gym's cancelled move to OCAC displaced longtime OCAC staff (its bad to have institutions displacing each other). I can say I never heard L&C art students complain that the Hoffman wasnt challenging or current or engaged enough, the opposite actually. Instead, it was without a doubt one of the best run spaces in the West Coast but always seemed to lack support from some higher ups. Will that change? contact L&C's president and tell them what you think: president@lclark.edu The irony is deep as now L&C President Wim Weiwel will have the main gallery of PSU's new art museum named after him and I know for a fact he likes attending art exhibitions. Many in the arts community consider this a crushing blow and an act of philistinism in a school with an otherwise enlightened reputation that is being tarnished, needlessly. True this is happening all over the country but L&C is a wealthy with a very progressive reputation. 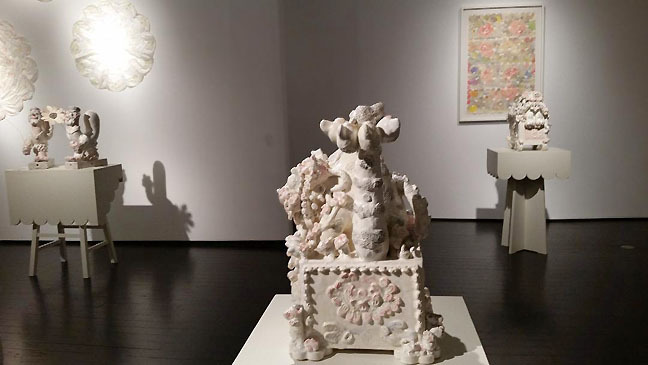 This is extremely unfortunate and The Hoffman rightly drew accoclades from Peter Plagens in the Wall Street Journal in 2012 for its student exhibition. 2012 graduate Drew Linehan described the news as, "remarkably disappointing." 2003 graduate Leah Emkin was shocked saying, "The Hoffman was an integral part of our arts program. Linda was very inspirational as a woman leader in the arts." Other Alumni indicated how the Hoffman under Tesner made the campus less isolated and brought the world to the wealthy enclave in the West Hills. How does looking more inward institutionally help a supposedly ultra-liberal arts college? Something does not sit right... a bit like a big hospital without a surgeon and replacing them with a part time medic. It just isnt the same thing unless the caliber of director remains and from everything I heard over the years it may have contributed to some bureaucratic aca-envy. Linda's program mounted large scale shows for local artists and L&C faculty as well as international artists. This exhibition and cultural exchange with Cuban artists and L&C students is a prime example of the great things Linda did that apparently was not valued. What this seems to be is a bureaucratic push for a different director so the question must be will it be be for someone of comparable expertise and program of comparable caliber? With the loss of so many institutions like the Museum of Contemporary Craft, White Box, Newspace, Art Gym etc. it seems like depth of long term curatorial experience that informs challenging shows doesnt seem to be valued very much. Agendas in higher ed can be some of the most political. Yet, what I liked about Linda is she was one of the most fair minded people in the art scene. The arts arent just a mouthpiece, they are an exploration and I'll be watching this closely. What is sure here is that Linda leaves very large shoes to fill as the Hoffman is not a tiny gallery. 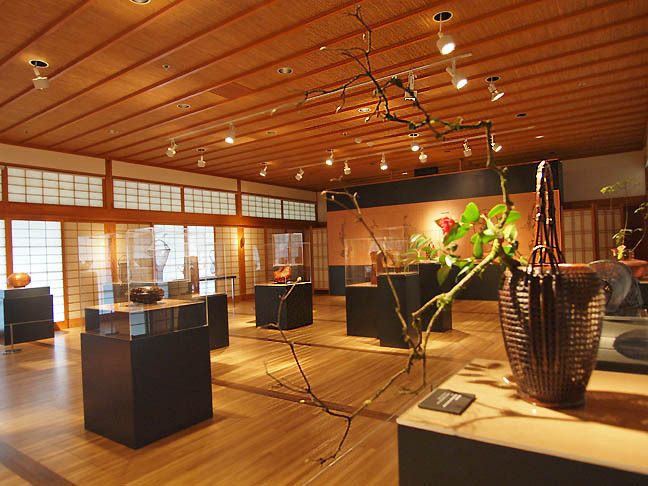 It is a large museum style space that requires a lot of experience and preparations to program. Its not the sort of space a faculty member can just pull off as a side gig and in general I fear for the state of L&C's art program. Lastly, let's all go and show our support this weekend. The current exhibition is one of their all time best and will host a closing event on Sunday December 9th from 2-4PM with a Gallery Talk and Pie Tutorial.